Shot on 35 mm film, Jonna Kina's five-minute work is a documentary portrait of two Foley artists recreating sound effects for the famous shower scene in Hitchcock’s Psycho (1960). The work investigates how sounds are produced for cinematic purposes and what happens when the conventions of film are deconstructed. Arr. for a Scene (2017) turns the cinematic situation upside down, using as its vehicle one of the most famous scenes in movie history. 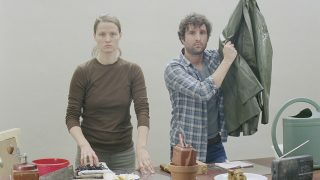 Instead of a tense murder scene, however, the viewer is presented with Foley artists Élodie Fiat and Gilles Marsalet at work recreating the sound effects. Using everyday objects such as a raincoat or watering can, they imitate the sounds of footsteps, a running shower and a door closing while looking straight into the camera. The inversion brings the viewer directly into the scene. Arr. for a Scene was awarded the “Best Nordic Short Film” award at the Nordisk Panorama festival in Malmö, Sweden, in 2017. Jonna Kina (b. 1984) is a multimedia artist whose principal media are photography, video, sound and text. She has studied in Helsinki, New York and Jerusalem, and she was selected for the ISCP residency in New York for spring 2019. More recently Kina’s works have been presented at Tokyo Photographic Art Museum (2018), Dunkers Kulturhus in Helsingborg (2018), Catherine Edelman Gallery in Chicago (2016), Kunsthalle Helsinki (2016), Musée de l’Elysée in Lausanne (2015) and the Finnish Museum of Photography (2015). Arr. for a Scene is on display in the media space at EMMA as part of the Touch exhibition, presenting Saastamoinen Foundation’s art collection. Touch presents a curated pick of Finnish and international contemporary works from the Saastamoinen Foundation Art Collection. With the overarching theme of humanity at its core, the show delves into fundamental questions concerning the human condition and the nature of human existence.